7 Breast Cancer Autoantibodies: Biological Significance or Epiphenomena? 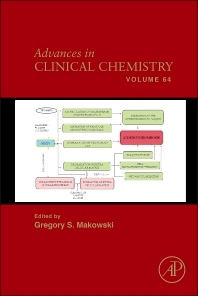 Volume 64 in the internationally acclaimed Advances in Clinical Chemistry contains chapters authored by world renowned clinical laboratory scientists, physicians and research scientists. The serial provides the latest and most up-to-date technologies related to the field of Clinical Chemistry and is the benchmark for novel analytical approaches in the clinical laboratory.